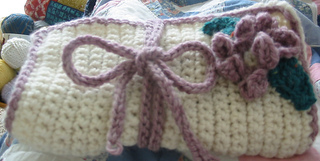 I did this project with some of my merino wool scraps in white/cream body and a heather-ish mauve trim. Unfortunately I do not remember what brand the yarn was or how much of it yard and grams wise there was initially. 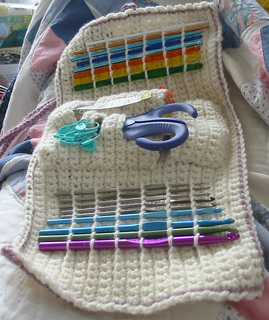 The case is so decadently soft I almost feel guilty making it with these scraps! The end result had some curling issues that were worse when the case is opened up, but over all I am very happy with the results. Rather than making/using a button, I made a simple cord that did a secure, triple wrap with a bow when closed.